When hip pain occurs either in older patients – those over age 70 – or among children or adolescents up to about age 15, the cause of the discomfort is often relatively easy to identify. But for people who fall between these age groups, the diagnosis and treatment of a painful hip is often more complex. 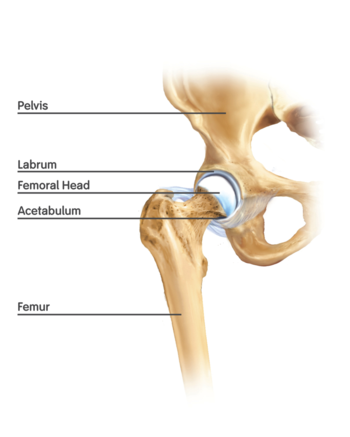 In the healthy hip joint, the upper end of the femur (thighbone) meets the acetabulum, fitting together like a ball and socket. Articular cartilage, a smooth protective liner covers the bones and limits friction between the joint surfaces during movement, allowing the ball to rotate freely in the hip socket. Another piece of soft tissue called the labrum, which is made of fibrocartilage, lines the outer rim of the hip socket to create a suction seal that helps hold the ball-like femoral head in place. Hip pain that is not related to osteoarthritis (usually associated with an older population) is often the result of either hip dysplasia, a condition in which the acetabulum does not develop fully, making it too shallow to adequately contain and support the femoral head, or femoroacetabular impingement (FAI), in which abnormalities of either the femoral head or the acetabulum result in too much friction in the joint. Related injuries to the cartilage and labrum may also be found in the painful hip. Hip pain stemming from anatomical abnormalities can affect anyone in the general population; however, serious athletes are particularly vulnerable, since the joints are subjected to significant stress loads during sports activities. "In many cases there is more than one underlying abnormality present, such as a component of dysplasia as well as impingement. The soft tissues that support the joint may also be involved," explains Bryan T. Kelly, MD, associate attending orthopedic surgeon and Co-Director of the Center for Hip Preservation at Hospital for Special Surgery (HSS) with Ernest L. Sink, MD, associate attending orthopedic surgeon. To address the complex nature of these injuries, the Center for Hip Preservation is made up of a multidisciplinary team of orthopedists and other physicians who can bring their areas of expertise to bear on each case. Highly sophisticated MRI and CT imaging techniques, available through the Department of Radiology and Imaging at HSS, also play an important part in diagnosis and treatment. To help ensure optimal treatment results, Dr. Kelly and his colleagues have established a prospective research registry that tracks the progress of patients treated at the Center. "Overall, we know that the earlier we can intervene the better the outcome," Dr. Kelly says. "Data from the registry helps us see patterns that show which treatments are most effective. The information is used on an ongoing basis to refine treatment decisions and develop clinical algorithms." Members of the Center team can also use registry information to help new patients know what they can expect from their treatment – whether the goal is a return to sports or the ability to participate in daily activities at home. "Hip preservation is a relatively new field," adds Dr. Kelly. "Its always a good idea to seek care at an institution where a range of treatment options are available and, should surgery be necessary, one where many of these technically demanding procedures are performed." Thanks to developments in appropriate treatment selection, advanced instrumentation, and arthroscopic and other surgical techniques, many patients seen at the Center for Hip Preservation at HSS achieve significant relief from hip pain. Techniques to repair cartilage damage, such as those that are currently in development at HSS, are likely to constitute the next advance in treatment, according to Dr. Kelly. "HSS now serves as the model on which other institutions will base the development of their Hip Preservation Centers of Excellence," he says. "In the future, collaborative research and clinical care at HSS and other institutions that have similar philosophies about the importance of multidisciplinary care will broaden the scope of care that can be provided to our patients." If you would like more information about treatment of hip pain at HSS, please visit the Physician Referral Service or call 1.877.606.1555.